Surface analysis refers to an analytical technique that acquires quantitative information from the uppermost layers of a sample. In Hiden SIMS/SNMS it can be anything from the uppermost atomic plane to a depth of several microns that are analysed. This is typically achieved through surface sputtering by a primary ion source such as a caesium (Cs), argon (Ar), or oxygen (O2) gun. Detectors then acquire positive/negative secondary ions, or the sputtered neutrals ejected from the surface. Efficient energy filtering of high energy secondary ions is used to improve the abundance sensitivity. The mass-resolved ions are quantified by their distinct mass spectral fingerprints, providing precise assessments of the atomic composition of a sample’s surface. These data are used to elementally map a sample for imaging or depth profile analysis and diagnostics. Surface analysis via mass spectrometry is commonly performed to detect and quantify the amount of trace-level contamination, intentional or unintentional, that arise in the upper atomic layers of a solid sample. The composition of these layers may also be characteristic of the sample’s mechanical behaviour, such as a hard coating, and surface analysis can characterise the quality of the film. Secondary neutral mass spectrometry (SNMS). This blog post will explore some of the products used to perform surface analysis via either of these cutting-edge techniques. 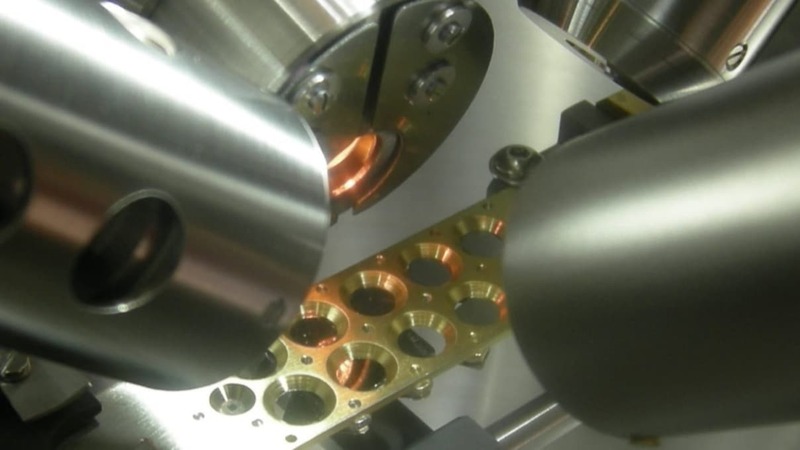 Both SIMS and SNMS operate on the principle of sputtering, which requires an incident source of primary ions to erode the surface of a sample material. These primary ions become implanted into the sample’s surface atoms and the resulting sub-surface atomic collision cascade causes surface atoms to be ejected – some of which are ionised. Hiden Analytical supplies two primary ion guns for surface analysis applications. The IG5C uses caesium salt to generate an intense beam suitable for depth profiling and elemental mapping of electronegative species. It boasts an etch rate of up to 30 nanometres (nm) per minute and a minimum spot size of below 30 micrometres (µm). The IG20 is used as a primary ion source for electropositive elemental mapping, using oxygen, argon, or xenon (Xe) gas to generate a high current beam suitable for depth profiling and surface imaging. During the atomic cascade, atoms in the surface nanolayers are energised and emitted into the measuring chamber along with backscattered primary ions. Emitted secondary ions may be in the positively or negatively charged state, but most ejected particles are neutral. The EQS is a high transmission detector used for SIMS surface analysis and surface science experiments. It is equipped with an electrostatic sector energy analyser, which can detect positive and negative ions with mass range options of up to 1000 amu, and has been used in conjunction with both the IG5C and IG20 ion guns. The EQS can be made available for SNMS surface analysis. The MAXIM analyser is a highly sensitive detector of positive ions, negative ions and neutrals; providing for both SIMS and SNMS surface analysis. It is equipped with a front mounted electron impact ioniser, which provides analysis of sputtered neutrals with reduced matrix variations compared to standard SIMS mass spectrometry. The atomic information acquired from a surface sample is resolved within the mass spectrometer and digitised through intuitive software designed for depth profiling and elemental mapping. The SIMS Mapper is used to generate interactive sample depth profiles and chemical surface maps to detect impurities and variations in surface morphology. These data can be qualified against a database of elemental species for quantitation of trace and matrix level substances. Hiden Analytical provides a robust range of mass spectrometry instruments for nanolayer surface analysis. These instruments can be custom-integrated into existing systems to enhance the diagnostic or process control performance in production industries. We also provide comprehensive SIMS and SNMS mass spectrometers for demanding industrial applications. These include the AutoSIMS, Compact SIMS, and SIMS Workstation tools. If you would like to talk about performing surface analysis with Hiden Analytical products, simple contact us.